Lark Books (NC), 9781454709336, 192pp. To develop a successful jewelry line, designers have to be more than just creative artists--they have to understand the ins and outs of running a crafts business. 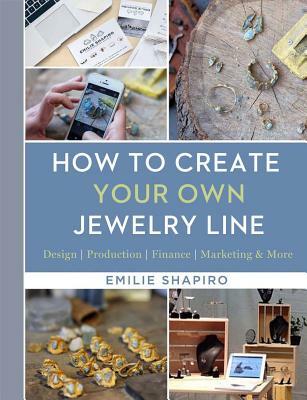 Emilie Shapiro's detailed guide explores the many facets of creating a quality handmade collection that people will buy, including where to sell your work, how to do small-scale production, how to carry out market research and publicity, how to price and present your pieces for greatest effect, and so much more. It's the perfect primer for budding jewelry entrepreneurs. Emilie Shapiro lives and works in New York City, where she designs and creates her own jewelry line, Emilie Shapiro Contemporary Metals. Before she started her own line, Emilie worked as the Production Manager at Pamela Love and Allforthemountain. She teaches wax-carving classes and specialty workshops at various studios including 92Y, Liloveve Jewelry School, and other studios throughout the NY Metro area. Her work is sold worldwide in locations such as the American Museum of Natural History, the Brooklyn Museum, and the Royal Ontario Museum.